Earlier this month my Motorola Droid X smartphone started acting badly. Sometimes it would simply refuse to do what I asked of it, other times it would shut down or start appls for no apparent reason. Recently I watch an important call ring and ring until it went to voice mail as I was watching it because it refused to answer. 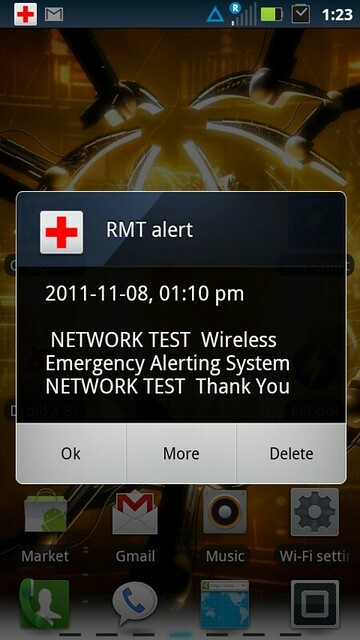 Well, I did some Googling around and discovered that RMT stands for "Required Monthly Tests" and that this program is part of the national Emergency Alert System that has been beefed up greatly since 9/11. 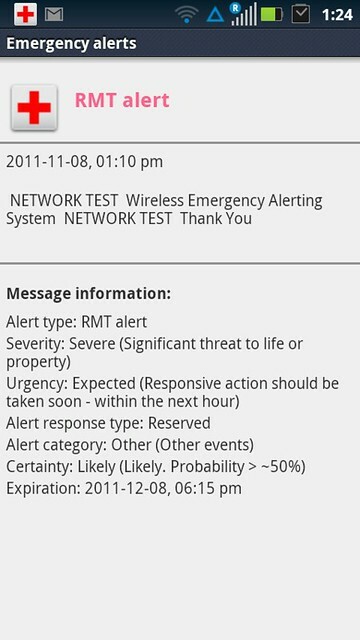 The system for cell phones and mobile devices, Commercial Mobile Alert System (CMAS), also known as the Personal Localized Alerting Network (PLAN), was funded by congress in 2006, was tested in NYC and DC on AT&T, Sprint and Verizon late in 2011 and went nationwide in 2012. Hence, my recent problems. 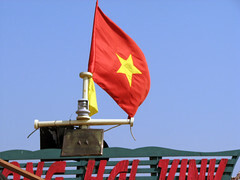 The system does not use the normal cell phone or text message communications facilities. It requires a special chip, which is currently only in a few advanced smart phones such as the Droid X and iPhone but is mandatory for all phones by 2014. The program is being run at the state level but is under the control the DHS department of the FCC, which causes me to question which agency is in charge here. The secure messaging network will likely display messages as notifications, rather than texts, and will push to all compatible devices within an affected area based on the phone's physical location, not just its mobile number. Local, state and federal officials will send notifications in response to disasters and other public safety threats, presidential announcements, and Amber Alerts. What it didn't say is that no "Opt-Out" is possible. But I wasn't receiving these alerts once a month, but several times a day, and after I discovered that it involved a mandatory chip in my brain, oops, I mean my phone, I began to suspect that the frequent alerts were somehow related to the other problems I was having with my phone. Thus began a two hour talk with Verizon tech support. Part of the reason the call took so long was that I had to go through two levels of tech support before I was talking to someone at Verizon that had even heard of RMT Alerts. When I did finally reach someone who had heard of it, that's about all he could tell me, yes, he'd heard of it, but he couldn't tell me anything about it and claimed that Verizon really had nothing to do with it. I ended up educating three Verizon tech support people as to what I had found out about this system. The other reason the call took so long was that the tech's solution to my problems was to completely reset my phone, which cleared all my setting, apps, contacts (which I saved), pictures, videos and all. It also meant that I had to read and agree to the Motorola license again. We are forever being confronted with software and other license agreements that we have to agree to and are far too long to read as a practical matter. This is pet peeve of mine, so on this occasion, I took the time to actually read it, with the Verizon tech listening. This took an hour even with me reading as fast as I could! The next day, I received a surprising follow up call from Verizon tech support. (surprising because if you ask them to call you back, they say they can't.) Patty, the Verizon rep, wanted to see if the phone was fix and if the frequent RMT Alerts had ceased. They both had, which furthers my belief that they were connected. She again insisted that these alerts had nothing to do with Verizon and they could do nothing about them, nor could she tell me who in the government I could talk to about them. She suggested that I call a local news channel, because maybe they would know something. I kid you not, the Verizon rep suggested that I call the news about a problem I was having with my Verizon phone! Go figure. While I can see the need for a national emergency alert system, the whole way this program is being rolled out, the lack of information and that lack of accountability gives me a very bad feeling about it. BTW, unless you remove the battery Big Brother knows where you are. They can even turn the phone on for you. Or just listen in and not change a thing. My Droid X is barely a year old but I've got the feeling that it was made in 1984.